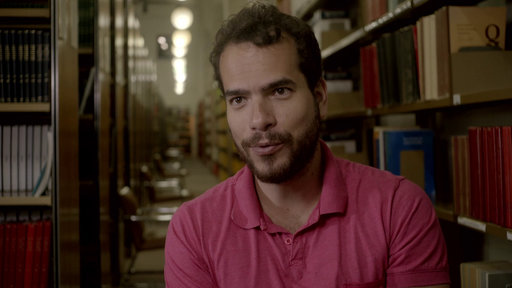 Brazilian math genius Artur Avila searching for ways to understand chaos in complex dynamic systems that evolve over time such as planets moving around a star or a population of organisms growing or declining over time. 00:00:32 but in which even simple short-term rules can cause big issues in the long term. 00:00:55 is a planetary system ruled by Newton's gravitational rules. 00:01:01 It doesn't need much more complication to become interesting. 00:01:18 which are well known, are regular and persist in time. 00:01:44 what can you say about behavior in the very long term? 00:02:20 one would like to be able to make interesting conclusions. 00:02:29 start interacting in more complicated ways and escape far beyond where they began? 00:02:44 and there are many other systems. 00:02:58 and try to predict what could happen with the system. 00:03:02 Maybe you want to know what would happen if you made a small intervention in it. 00:03:07 Would it be catastrophic, or potentially catastrophic? 00:03:44 that don't initially seem to be about dynamic systems. 00:04:10 is the discovery of the frequency and inevitability of chaotic behaviors. 00:04:39 accurate predictions of what behavior will be at any given time. 00:04:53 at that moment, what would the state of that system be? 00:05:06 What will temperature be at a very precise moment in the very distant future? 00:05:14 can't reasonably give intelligent answers to. 00:05:24 which is also something that has been developed. 00:05:54 but rather 'average behaviors'. 00:06:01 average temperature will likely be about Y'. 00:06:05 This is somewhat related to the robustness of statistical laws. 00:06:15 a situation in which you are playing a game of heads and tails. 00:06:26 is not one you can say much about. 17:09:18 It's either heads or tails, 50/50. 00:06:34 So you can't predict accurately. 00:06:46 with error margins that can be well estimated. 00:06:53 but not about a single toss. 00:07:00 Heads/tails tosses have inherent randomness. 00:07:09 but whose intrinsic complications create behavior close to randomness. 00:07:22 is through a law that assumes the system is truly random. 00:07:26 It can be approximated quite well by a system very similar to coin tossing. 00:07:34 about this system's average behavior. 00:07:43 modern dynamic systems theory can offer when chaos is involved. 00:08:01 I have worked on several aspects of dynamic systems. 00:08:12 I didn't work only on chaotic systems, that was more a general example. 00:08:33 in different scenarios is the one known as renormalization. 00:08:45 and represents different things in different areas. 00:08:54 and maybe others for other fields of Math. 00:09:02 of a system in a certain 'subarea'. 00:09:15 but, as usual, over a very long time horizon. 00:09:36 and that subarea is in fact your whole space, that it corresponds to the whole. 00:09:56 even though it is not exactly the same. 00:10:04 that has certain specific features. 00:10:16 leads from one dynamic system to another, but within the same 'class'. 00:10:31 in certain classes of systems that are not chaotic. 00:10:39 you produce something with much more chaos. 00:10:44 Information loss becomes much faster with a longer time scale. 00:11:00 of arriving at a system not so different, qualitatively, from what you had before. 00:11:18 and making that operation in the dynamic systems space. 00:11:25 In general, you consider this acting over systems in small dimensional scales. 00:11:44 on a plane or on a straight line. 00:12:02 is this operation in a class of systems that live in an infinite-dimension space. 00:12:11 you can repeat it - and you are interested in repeating it. 00:12:17 that now acts, that 'lives', in a much bigger space. 00:12:37 about this infinite-dimension system. 00:12:45 when we discover this infinite-dimension system now has chaotic features. 00:13:02 about the low-dimension system we were interested in at first. 00:13:10 and was well developed in several directions in the next decades. 00:13:39 which are also modeled on dynamic systems that frequently can also be renormalized. 00:13:57 It's an idea that has been developing for a while. 00:14:14 and you have to integrate them to understand things. 00:14:19 I began working in the low-dimension dynamics of the interval. 00:14:29 such as the Mandelbrot Set and the like. 00:14:42 that could also be subject to renormalization theories. 00:14:52 because the questions that it can help answer are different. 00:15:00 it was interesting to me how the questions were asked differently. 00:15:05 The ultimate goal wasn't even to understand a given dynamic system. 00:15:18 which will correspond to a dynamic, now a non-classical one. 00:15:21 Before, I was talking of classical dynamics, with deterministic laws. 00:15:47 to understand a piece of the equation. 00:15:54 associated with the various possible energies for your quantum system. 00:16:05 and will yield a good behavior of that system's functions. 00:16:14 I had a long learning process to discover what interested people. 00:16:34 to reach any conclusions on the aspects of that equation at the end. 00:16:40 Renormalization, then, was one part of a theory, but I branched out later. 00:16:46 I started by using it, it was sort of the way I started. 00:16:58 renormalization could be used to better understand some specific problems. 00:17:23 merely by using renormalization slightly differently from how it was used before. 00:17:42 be reunified with renormalization for a deeper understanding of the area. 00:17:47 But this took many years. 00:18:13 Specifically, understanding the appearance of 0 or positive Lyapunov exponents. 00:18:24 which detect a bit of the instability of the system. 00:18:28 What is the speed at which orbits separate, for instance? 00:18:45 which is the rapid loss associated with chaotic systems. 00:18:58 I usually work with many potential problems. 00:19:09 thinking in different directions. 00:19:20 ideas on how you can move forward or what the strategy is. 00:19:45 in a more comprehensible way? 00:19:52 and many ways to find associations and move ahead towards a solution. 00:19:59 But without a starting point, that gets very hard. 00:20:03 There isn't much to do. 00:20:09 you can't get past a certain point. 00:20:15 there is no formula on how to get out. 00:20:47 you don't have what you need at that time. 00:21:12 that you can see as useful to the problem you were working on before. 00:21:18 This happened with me sometimes. 00:21:28 helped open the path for progress in another context. 00:21:38 Sometimes it's just a different perspective on something. 00:21:44 but you needed the right angle to pick the right way to move forward. 00:22:23 That depends a lot on the situation. 00:22:27 Each project has its own traits. 00:22:52 more calculation-heavy approach to systems. 00:23:04 it limits what you can calculate. 00:23:12 until the moment the calculation you need becomes evident. 00:23:18 It becomes so simple that you can do it in your head. 00:23:27 and see how this can be interpreted differently. 00:23:35 can be manipulated so you can look at how they can interact differently. 00:23:44 because I think it tends to be very fruitful. 00:23:58 and other people can do the calculations, and sometimes they don't get there. 00:24:05 and sometimes it can merge with the calculation work some of my colleagues did. 00:24:43 The goal is not for me to be inspired by my environment. 00:24:51 and you can be without a clear distraction. 00:25:02 will not cause great distraction, because it is constant. 17:27:52 If you had people screaming around, thing would be more complicated. 00:25:10 You usually want an environment where you do not worry about what is around you. 00:25:18 but mostly you want to have calm periods. 00:25:25 what you think depends on the situation. 00:25:46 which can be seen as dynamic systems. 00:26:10 the different interactions between them..
00:26:13 how they evolve with the application of certain linear transformations. 00:26:38 'domesticated' by the technique we were thinking of using. 00:27:00 influenced by a certain dynamics - a chaotic one, in this case. 00:27:16 modify the expressions to take this new scenario into account. 00:27:27 because it wouldn't be useful for that. 00:27:30 I needed a good understanding of the nature of the obstacle. 00:27:36 it took a long time to overcome this problem. 00:27:58 and then try again after a while. 00:28:04 but it might be worth revisiting later. 00:28:07 Maybe an idea will come out from something else that has matured. 00:28:10 So you try again. 00:28:19 but you keep trying, and sometimes a solution comes out. 00:28:45 and which I always find the same difficulties with. 00:28:48 But I come back to it in the hope I will see something different. 00:29:24 and eventually in technological progress. 00:29:35 was important for us to have the resources we take for granted today. 00:29:51 and what breakthroughs will have the biggest repercussions. 00:30:00 with clearer goals for immediate application. 00:30:25 are based on research that requires very targeted Mathematical breakthroughs. 00:30:43 have a direct application in possible technologies. 00:31:06 of persons working on different things end up reverberating. 00:31:45 It all interacts in the end. All these ideas interact. 00:32:26 what someone with a 'clearer' goal needed. 00:32:32 These ideas go in these directions, and the opposite direction as well. 00:32:59 will also find questions and techniques from research done with clearer goals. 00:33:07 Ideas will go from one side to the other, and vice-versa. 00:33:27 to a certain goal within a certain time frame. 00:33:45 this work in all of these directions at the same time. 00:34:37 and which will interest me due to what I have studied and have been thinking. 00:34:46 and a trend to try to seek a better understanding of certain parts of Math. 00:34:57 A willingness to understanding something that is often focused on specific issues. 00:35:10 that identify the main difficulties associated with that understanding. 00:35:20 Many times, however, you don't work on responding questions asked of you. 00:35:25 Many interesting questions you ask yourself. 00:35:39 you see the question as something different from what other people see. 00:35:55 which is influenced by past experience and knowledge. 00:36:00 Each Mathematician brings their contribution. 00:36:03 I bring mine, which comes from an intercession of many prior things. 00:36:21 that wouldn't have been natural for other people in that area. 00:36:28 in my study of Schrodinger operators, or a certain class of them. 00:36:42 and ended up doing a little bit of everything. 00:36:53 made it clear that they were essential, and that were needed for progress. 00:37:07 with context so that it can be developed. 00:37:30 that will answer the questions that were asked. 00:37:40 One would expect, then, that beautiful Mathematical techniques will be reused. 00:37:59 who can use it in varied situations. 00:38:04 It is desirable that this is the natural path of discovery in this field. 00:38:27 I think people say this more because of my work style. 00:38:34 In a few of the topics I studied, I came sort of from the 'outside'. 00:38:47 I found few people who wanted to talk to me about what I was working on. 00:38:54 Then, so I wouldn't keep talking to myself, I wanted to learn what was being done. 00:38:59 But I didn't know a lot about what they were doing. 00:39:15 Acceptable, of course, but an unconventional approach to relatively complex things. 00:39:29 but that would tell me something from the point of view I was coming from. 00:39:52 and see what that tells me. 00:39:57 Sort of thinking from scratch. 00:40:22 that weren't seeing progress in that direction. 00:40:35 and didn't try too much. 00:40:37 For a while now, I've had this trend of not studying the works of others so much. 00:40:44 I know what has been done, but my main strategy is not to read it in depth. 00:40:52 but without trying to understand the literature exhaustively. 00:41:01 and try to think of something different that can help to advance these. 00:41:11 if I tried to improve a little on techniques people are already trying to apply. 00:41:28 and on what would be natural for someone not deeply involved in an given area. 00:41:35 I suspect that is what people alluded to when they told you this. 00:41:59 you are not really presented to what really is a Mathematical work. 00:42:09 and that they have their characteristics, and some internal logic. 00:42:28 just like other areas of knowledge. 00:42:39 looked interesting from the start. 00:42:55 and I 'didn't dislike' that aspect. 00:42:59 Then I became interested in Math Olympiads, solving Olympiad problems. 00:43:06 And I found those a lot of fun, too. Studying those problems. 00:43:18 I had to learn more, which I also found interesting. 00:43:22 This more abstract learning. 00:43:26 with the characteristics I described just now. 00:43:30 And it was interesting. 00:43:40 or hate this aspect. 00:43:43 That is perfectly possible. 00:43:58 it looked very interesting at that time. 00:44:04 it doesn't entice me today, but it was important to me at that time. 00:44:12 and allowed me to progress a little bit faster. 00:44:14 There was no moment of "I'm not interested in Mathematics anymore". 00:44:19 "I have lost interest in this area. I don't want this." 00:44:47 which is what interests me now. 00:45:19 and its story is well-known. 00:45:29 It was the first one. 00:45:31 And its message was to convey unity of the Mathematics community. 00:45:48 and there were problems with nationalism and things of the sort. 00:45:55 So there are historical reasons for how it was introduced. 00:46:03 wanted it to be an award given to young people, younger than 40. 00:46:20 by someone who is active and likely to continue working. 00:46:34 which is usually given as a reward at the end of a career. 00:46:54 to seek to obtain some award for it. 00:47:02 even because many things are discovered by looking at less promising directions. 00:47:14 you end up discovering something that becomes and is seen as fundamental. 00:47:19 It is important that people look at all directions. 00:47:27 we will have very biased perspectives, and things won't develop as well. 00:47:33 Also, you do better Mathematics if you do something that genuinely interests you. 00:47:39 That is the real motivation. 00:47:46 to work in depth aiming at something so rare to achieve. 00:48:23 but the positive side is that it has an expiration date. 00:48:29 After all, these awards are given, and then fulfill their role. 00:48:43 is to communicate with the public. 00:48:47 It is through these awards that people see progress is being made in science. 00:49:02 and people will talk about advances in Medicine, Physics, Chemistry etc. 00:49:09 And this is interesting. 00:49:14 and how important it is, and that it continues to be done. 17:52:11 to a community that won't hear this constantly. 00:49:28 the most important contribution of these awards. 00:49:35 they have this negative potential to generate harmful competition sometimes. 00:49:48 is that it has a deadline. 00:49:49 When you get to 40 you no longer need to worry about it, regardless of the result. 00:50:02 in terms of making people continuously obsessed with this goal. 00:50:23 Yes, but I also don't understand a lot of what is done by the community. 00:50:35 the depth and enormous number of different directions people research. 00:50:55 issues of a general part of Mathematics known as Analysis. 00:51:10 But there is some more flexibility. 00:51:22 This is home to another type of thinking, that I find more rigid. 00:51:38 even things that are not so complicated. 00:51:45 I lack the framework to be able to say much about them. 00:51:57 are not accessible to people not working on them. 00:52:06 A few aspects of discoveries end up being gradually conveyed. 00:52:14 This is one of the ideas I put forward. 00:52:21 and they often 'transfer' these ideas. 00:52:30 but it has this potential. 00:52:39 and this is also done by people working with me in other directions. 00:52:48 I would consider it natural to see this difficulty of communication. 00:52:57 but at the same time I don't worry much that they will be isolated eternally. 00:53:17 by a few ideas developed in this area. 00:53:37 I realize I didn't envisage 10 years ago what I am doing now. 00:53:50 but will certainly be interested in others I cannot predict now'. 00:53:58 to be unable to make such accurate predictions. 00:54:01 It doesn't worry me much not being able to predict as much. 00:54:19 In Mathematics it is easier. 00:54:21 In other sciences you work close to the technique, and production is direct. 00:54:33 and have to manage other people and their work more than your own. 00:54:39 In Math that doesn't happen often. 00:54:47 often tend to work as close to the 'base' as they did when they began. 00:54:59 is to continue to work directly 'hands on'. 00:55:05 I am glad that Math is like this. 00:55:16 instead of having the pleasure to continuing to make discoveries directly. 00:55:47 often don't know how Mathematicians think of mathematical objects. 00:55:57 but I believe some things are relatively general. 00:56:04 You are not working only with equations and numbers. 00:56:12 basically corresponding to mathematical objects. 00:56:28 so each Mathematician has their own interpretation, sees them differently. 00:56:42 but there is an inner interpretation of that. 00:57:01 and with aspects revealed when seen in a certain way. 00:57:16 sometimes between things that did not appear to be related. 00:57:40 We call it "richness". 00:57:55 and to call these types of objects 'beautiful'. 00:58:03 That is basically it. 00:58:08 and communicated between them. 00:58:11 There is this attempt to communicate, which is interesting. 00:58:19 but manage to convey them in a way. 00:58:25 but you do convey a few aspects that enrich the understanding by the other. 00:58:31 But it is sill very individual, how one interprets each universe. 01:00:13 and which always develops. 01:00:16 The more you learn, the more you find that you ignore as it develops. 01:00:27 than the pace of discovery of what we don't know. 01:01:15 and are fully replaced over time. 01:01:21 but does not invalidate what has been discovered in the past. 01:01:29 but it persists quite well. 01:01:55 that has its characteristics, that has its logic. 01:02:14 lead to the fact that when you reach a goal, it is stable. 01:02:27 And that is not something easily found elsewhere. 01:02:33 That is something pleasant to think about. 01:02:53 with its rules, and its stability. 01:03:06 I would say that, emotionally, that has a small role in that sense. 01:03:19 Afraid… I guess I'm not afraid. 01:03:34 in which it looks like you are not making progress. 01:03:37 That is normal in any long career. 01:03:50 being at the right moment and having a bit of luck as well. 01:03:59 This type of concern doesn't affect me much. 01:04:16 remain determined, and appreciate when things work. 01:04:39 seeking to take them a bit further. 01:04:52 is what is more visible as 'work'. 01:05:03 and you wait for this 'unblock'. 01:05:20 which involves a lot of creativity, but when it's easier to understand what is needed. 01:05:28 It is more 'concrete', perceivable work. 01:05:44 is an interesting one emotionally. 01:05:48 It combines several things. 01:05:56 but sometimes that's inaccurate. 01:06:08 of what can unfold from that idea. 01:06:18 and sometimes cling to keeping it alive in the face of difficulties. 01:06:31 to attack your own ideas to find possible faults. 01:06:39 It's an emotionally complicated approach. There are several sides of you. 01:07:03 so you're not working with an idea that turns out to be problematic. 01:07:15 and in general is what precedes this more arduous work. 01:07:21 You need to think about it, but have the feeling something can happen. 01:07:41 at a very complicated direction. 01:07:43 I think things happens more naturally. 01:07:58 'This could finally be useful for that big problem you considered before'. 01:08:03 So I prefer not to look directly at the problems. 01:08:39 so I avoid thinking in terms of 'I would really like to solve problem X'. 01:08:48 but it is not something I define as a major goal. 01:09:24 with non-Mathematicians and mathematicians as well. 01:09:30 I don't think I'd have a great need to discuss work with them. 01:09:55 It's natural not to be interested in them. 01:10:30 that resisted approaches for a long time, that is true. 01:10:37 This is a feature of the way I work. 01:10:43 And I like solving problems like that, and to formulate questions. 01:10:57 but some because they cover issues for which I've developed a certain 'affection'. 01:11:14 but is not something I need to discuss with everyone. 01:11:17 I don't need everyone to appreciate it. 01:11:21 The most fundamental appreciation for your work must be your own. 01:11:25 If you don't appreciate your own work, you'll have a lot of trouble pursuing it. 01:11:48 I have no need for everyone to appreciate my contributions. 01:12:02 I always work a lot with others, and find people I can talk to. 01:12:40 or even improve what we had. 01:13:15 but that is fundamental for the progress of Math. 01:13:20 So I see the contributions of all who worked in this field. 01:13:29 I wouldn't have done anything or have a field to work on. 01:13:43 I do hope it is, and that it will be useful to people. 01:13:51 but that increases the overall mathematical knowledge of the community. 01:14:10 but there's this additional component, and I don't particularly feel it is missing. 01:14:52 Between mathematical thought and everyday life? 01:15:14 Depends on the type of problem you're working on. 01:15:27 and try to look at them differently. 01:15:54 but which has some internal complexities. 01:16:13 to estimate the consequences of certain processes. 01:16:20 and see if that reveals any other traits to be explored. 01:16:46 Hard to describe further than that. 01:16:48 And that also varies in each situation. 01:17:14 It is possible to get distracted in a few situations. 01:17:24 to become somewhat involved. 01:17:54 and in which you develop a feeling of safety. 01:18:05 initially lightly, but then draw a lot of your attention inadvertently. 01:18:19 but you are creating the possibility that it will. 01:18:35 where the need to have your own car is reduced. 01:18:48 while in other cities of the world that could be an issue. 01:19:10 to a relatively repetitive activity feeling like I can't distract from it. 01:19:19 I don't see the need for that. 01:19:41 or why people should study it. 01:20:42 don't require for you to immediately see why it is beautiful or moving. 01:20:59 it can have the same potential impact. 01:21:46 and the formation of a mathematical universe. 01:22:02 that each one only knows a small part of, but can contribute to. 01:22:12 that it attracts people. 01:22:17 Not all people, since each will be attracted to something different. 01:22:26 as other completely natural forms of expression. 01:22:46 because they considered it something natural to pursue. 01:22:55 As part of the human quest. 01:23:15 we should remember that it is more than that. 01:23:23 It incorporates other things that should be appreciated in a more intrinsic manner. 01:24:25 finding out more about things that are well-established discoveries. 01:24:29 Of course, people make mistakes. 01:24:31 It is part of the process. 01:24:43 the mathematical knowledge being developed is considered in general to be true. 01:24:57 regarding the true nature of the status of a certain discovery made. 01:25:12 and so there is no great doubt when one is working. 01:25:17 It is something quite characteristic of our knowledge. 01:25:39 but we have arrived at notions of the limitations, of where Math can take us. 01:25:47 Ambitions of total formalism have been somewhat abandoned. 01:26:11 and are now well understood. 01:26:13 Mathematicians essentially accept the limitations of what they can work on. 01:26:20 They know these limitations. 01:26:25 they have the continuous feeling of obtaining something true and permanent. 01:26:46 without the goal of achieving immediate application outside Math. 01:26:51 It may find application, and many times it does. 01:26:57 It is more a way of selecting your research objects and your intention in studying them. 01:27:13 sometimes the objects are the same. 01:27:24 and pure Math on others. 01:27:26 In the end, you will potentially be using the same things. 01:27:31 If it is Math, the same tools are valid for one side or the other. 01:27:41 Is your interest intrinsic to Math, or are you seeking direct application of it? 01:28:12 due to the characteristics I mentioned, such as its richness, beauty etc. 01:29:31 and that occupies relatively little time. 01:29:50 to make connections in a more predictable way. 01:30:10 is something I spent less time on. 01:30:15 but in general you get to the conclusion you already had very quickly. 01:30:26 and that you're not getting any further. 01:30:30 I don't consider it very useful to keep persisting in this. 01:30:36 In this problem in particular, recently I've been ending up in the same place. 01:30:41 Even though I try small variations, they all take me to the same place. 01:30:45 When I realize this, I tend to abandon it for a bit longer. 01:30:51 But that is not a large part of my day. 01:31:02 Every day has its characteristics. 01:31:10 but as part of my practical obligations and the like. 01:31:29 and that will occupy a specific part of my day. 01:31:36 but that changes from day to day. 01:31:37 I don't have fixed times in my schedule. 01:31:44 so I need to adapt my schedule to time zones etc. 01:31:49 No need to follow a very precise routine. 01:32:24 for a while now I've had the habit of waking up late. 01:32:27 I usually wake up at around noon or later. 01:32:32 And… These are my hours. 01:32:42 but on the other hand, I go to sleep later. 01:32:55 I do my chores when it is most convenient. 01:33:12 It's hard, at least for me, to say "I will book this time for abstract thinking." 01:33:27 and without other sources of stress that can divide my attention. 01:33:35 I wait for these moments to happen naturally. 01:34:06 because I end up wanting to change things at the last minute. 01:34:20 so I try not to plan too far in advance. 01:34:29 but fortunately my work allows me to keep doing it this way. 01:34:39 within a very well-established routine. 01:34:52 and would bother me. 01:34:54 It is not a prerequisite to do the type of discovery I do. 01:35:00 I think it is more because of the emotional perception than anything else. 01:35:26 and that we do not put much stock in social conventions or norms. 01:35:37 They exist, but they do not prevent a person from doing their work. 01:35:53 won't have the chance to work in them. 01:36:06 but who are contributing in many ways. 01:36:09 In the end their work will be assessed for its content, for what it brings. 01:36:23 and compare with different arguments and interpretations. 01:36:34 and it can be assessed despite the rhetorical skills of the person defending it. 01:36:49 and say 'Yes, this answers the question' or not regardless of the person's personality. 01:36:56 This is quite desirable, because it doesn't exclude people that could contribute. 01:37:15 but we don't exclude people in that regard. 01:37:20 There are all sorts of people in Math. 01:37:28 it's just that they are accepted. 01:37:33 and all sorts of people can be represented. 01:38:08 It depends on what you are investigating about the world. 01:38:19 and the effect of chaos must be recognized. 01:38:30 for instance, simply in the capacity to express physical laws in mathematical terms. 01:38:36 It is not obvious why that is possible, even in principle. 01:38:41 The fact that this happens allows for short-term predictability. 01:38:50 This is a form of order that has no reason to exist. 01:39:01 but it is not at all obvious that it has to be that way. 01:39:09 knowing that nothing completely unusual will happen from a moment to the other. 01:39:14 There is a certain awareness of that. 01:39:16 So it depends on the issue. 01:39:24 and in which order will prevail. 01:39:28 the fact that tomorrow the Moon will be present in some way or another. 01:39:33 Maybe full moon, maybe new, but there is not much doubt it will be there. 18:42:28 But it is an aspect of order we incorporate. 01:39:47 you need to be prepared for other things. 01:39:54 but it is important to appreciate that there exists a great order as well. 01:39:58 It all depends on what you are researching.